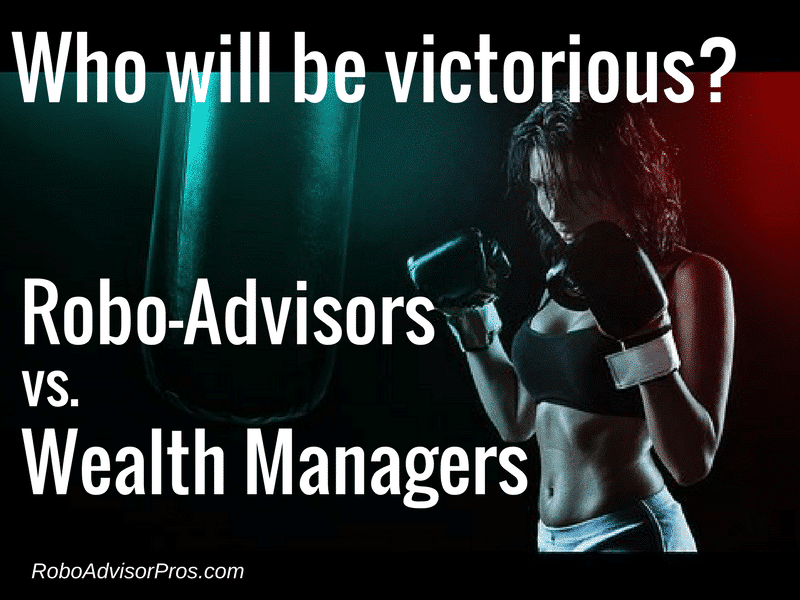 Robo-Advisors vs Wealth Managers - Who Will Be Victorious? YOU ARE HERE:Home » Investing Commentary » How Do Robo-Advisors Fit in With Traditional Wealth Managers? How Do Robo-Advisors Fit in With Traditional Wealth Managers? Robo-advisors are upending the wealth management industry. Digital wealth managers are launching new platforms, merging, and creating hybrid models. Robo-advisor growth is explosive, but digital investment advisors remain small participants in the total global wealth management AUM. Discover whether the robo-advisor is a true threat to the conventional wealth manager or not. I recently found a message from an ambitious international graduate student in my LinkedIn inbox. Maryna requested an interview to discuss the state of the robo-advisory field. 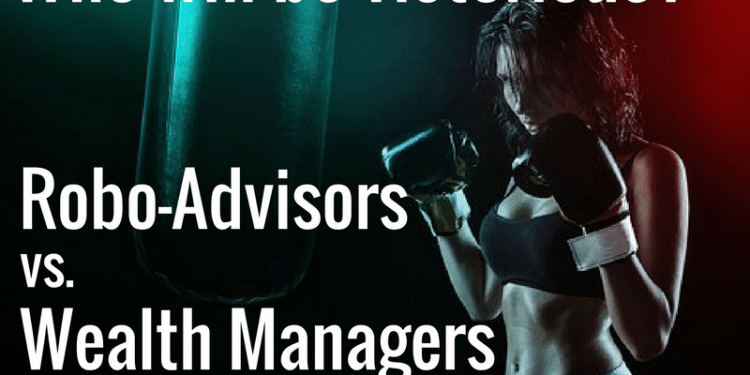 As the co-leader of an international robo-advisory marketing study and the owner of Robo-Advisor Pros.com, she was curious about my insights into this explosive offshoot of the financial advisory field. Consider these insights on the effects of robo-advisors on the traditional wealth management industry. MT: Who is more effective: traditional managers from banks and investment companies or robo-advisors? BF: It depends on the investor. If you are an investor with a lot of money and a complicated financial situation, in most cases, a robo-advisor is not for you. For the rest of the public there will be a robo-advisor or a hybrid model which includes robo-advisor and financial advisor that would be appropriate for you. Ultimately, whether a robo or human financial advisor is appropriate depends upon the individual investor and the specific robo-advisor. MT: In comparison with traditional financial advisors, are robo-advisors considered more substitutes, complements or something in the middle? BF: That is a great question! For the millennials, the young investors like you, robo-advisors are substitutes. So, instead of going to a bank or a brokerage and talking to the financial advisor, you’ll meet your investment goals with a robo-advisor. As you get older robo-advisors might be a complement. You could have your money managed with a low-fee robo-advisor such as WiseBanyan or Wealthfront. If you need more investment help, you might pay a fee-only financial planner for a visit or two. Bettterment or Vanguard Personal Advisor Services. Additionally, many financial advisors are adding robo-advisors and creating a complementary product in house. MT: What is the effect of robo-advisory on the current wealth management market? BF: In 2014, the global wealth management market was worth approximately $74 trillion. So, it’s a huge market and the robo-advisors are a very small percent of the total market. A study by BusinessInsider projects that by 2020, robo-advisors will manage ten percent of the total global AUM. Although digital wealth advisors are growing quickly, their impact on the wealth management market is slight. In several years, another look at the wealth management landscape will determine whether robo-advisor growth is making a greater impact on the field. MT: Ok, we’ll see. So the effect of robo-advisors on the wealth management landscape is quite minor? BF: Today, robo-advisors’ impact on the wealth management industry is minor. Despite the fact that robo-advisors are in the news and growing rapidly, they have yet to create a major threat. Yet, many traditional advising companies worry about the digital robo-advisors because they are riding the trend for investors to seek lower-fee managers. And, robo-advisors charge lower fees. So, wealth managers are reducing their fees to compete with lower fee robo-advisors and protect their market share. MT: What are traditional financial advising companies doing to overcome robo-advisors (merging, launching similar online advice…)? BF: All of the above. Many individual registered investment advisors, financial companies and wealth management firms are seeking ways to automate their investment management. By adding algorithm-driven investment management components they can reduce costs and fees. This helps the wealth management firms retain and increase their client base and better compete with the robo-advisors. Established investment firms are buying existing robo-advisors, such as Invesco’s acquisition of Jemstep, Blackrock’s purchase of FutureAdvisor and Ally’s recent merger with TradeKing Advisors. Others are creating their own robo-advisors, such as FidelityGo and Schwab’s Intelligent Advisory. Finally, individual registered investment advisors are white labeling robo-advisor platforms to handle investment management. MT: Thank you! Now about the trend development. BI author, Sarah Kocianski wrote about trends in “The Robo Advising Report“. Some sources provide forecasts for 2020 robo-advisor growth: $0.82 trillion in global AUM (Statista), $2.2 trillion (KPMG), $8.1 trillion (BI Intelligence). Should we be that optimistic? What growth rate is more likely? Who to believe? BF: If current robo-advisor growth rates continue, future growth explodes. A recent BlackRock study outlines a rapidly increasing number of Robo-advisory firms launching in the USA alone. In 2013 there were 22 launches, 2014 – 37, 2015 – 44. Those numbers don’t include the European growth. So, I see the robo-advisor trend increasing. MT: What about the long-run? How will robo-advisory manifest in future (hybrid form, leading provider, minor competitor or not popular at all)? Not in a few years but in 15-20 years. BF: The hybrid form is growing very quickly. Recently, I was a co-chair of a marketing consultation on this topic with approximately 20 experts both from Europe and the USA. The expert consensus is that hybrid providers will be the leaders. I expect the existing wealth management companies – Vanguard, Fidelity, BlackRock, Schwab, etc. – to continue grabbing market share from the start-up robo-advisors. Unless the smaller robos gain a unique niche, such as M1 Finance, who combines DIY with automated investment management, it’s going to be difficult for the small players to continue. I am not saying they will all disappear, but I expect that in 15 years they’ll need a unique value proposition in order to compete with the well-financed wealth management companies. MT: In the US must these wealth giants be registered as investment advisors and are they regulated? BF: Yes, they all are registered investment advisors (RIAs). The Securities and Exchange Commission (SEC) and Financial Industry Regulatory Authority oversee the investment industry. MT: Are there any Robo-Advising companies you want to outline here (maybe you use one or know personally the development story)? 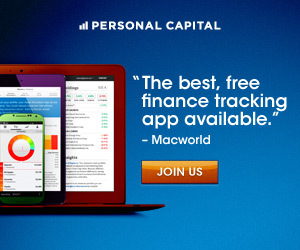 BF: Yes, I use the Personal Capital free investment management software. Additionally, I have used WiseBanyan. I write about most robo-advisors for Investopedia and Robo-Advisor Pros.com. So I am familiar with most robo-advisor platforms. I also cover the research on best performing robo-advisors on Robo-Advisor Pros.com. Finally, it’s important to recognize that there’s a lot of within-industry differentiation among robo-advisors. Maryna Tykholoz – MBA International management at Furtwangen University, Germany; M.S. Banking business at Kyiv National Economic University. Located in Zürich, Switzerland. Fields of interest: wealth management, private banking, FinTech, Robo-advice.